It's no secret that I love to read. It's why I'm always eager to do book reviews. 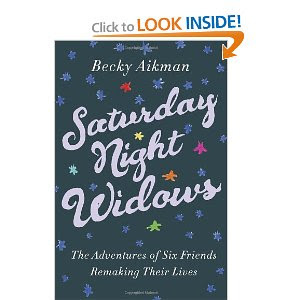 I was given the opportunity to read a book called Saturday Night Widows by Becky Aikman. It tells the story of Becky, who loses her husband when she's only in her 40s. She's kicked out of a widow's support group (for upsetting the older widows who feel that since she's in her 40s, Becky can easily move on with her life) and decides to start her own with 5 other women. They are all dealing with heartbreak and come together to heal once a month for a year. All the women are figuring out ways to cope with their status of being a widow. To find out more about the author, Becky Aikman, check out her Facebook page. She also has her own webpage here. Do you want your own copy? Crown is going to send a lucky reader a copy of Saturday Night Widows! I will run this contest until February 15th. *I was not compensated for this post but was given a free copy of the book to review. All opinions are my own. I like Becky Aikman's Facebook page! I'm always looking for new books to read! Thanks for the recommend! That sounds like a good book! I liked the FB page! Liked her on FB! Her book sounds really god! And, following on Twitter now! My twitter ID is crucifiedlullab. I liked Becky's FB page! I like Becky Aikman on Facebook. I am following Becky Aikman on twitter.